The Cowley College Concert Choir and Concert Band will present its first concert of the fall semester at 7 p.m. Tuesday, October 27. 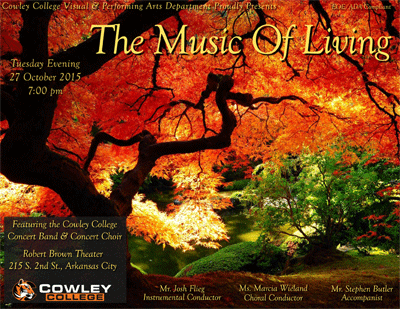 The concert, titled The Music of Living, will be held inside the Robert Brown Theatre and is free to attend. The Concert Band will perform Always United, Forever Strong by Brian Balmages, Fortress Variations by Tim Waters, Fantasia on British Sea Songs by Henry J. Wood/arrangement by Douglas E. Wagner, Abide With Me by William Monk/arrangement by Jay Dawson, and Ngoma za Kenya by Paul Basler. The Concert Choir, under the direction of Marcia Wieland, will perform The Music Of Living, Vere languores nostros, Requiem, Tres Cantos Nativos Krao, and Take Me To The Water. Wieland is eager to continue the rich tradition of excellence in Cowley’s choral singing as she prepares for her first concert as director of Cowley’s choral and vocal programs. Mr. Stephen Butler will serve as an accompanist. Rebecca Dewberry, Emily Lawson, Paige Lundin, and Keah Benck. Molly McCune, Ashley Daniels, Juliana Soto, Kayla Powell, Whitney Osalla, and Hanna Coryea. Mairi Baker, Rachel Burroughs, Charity Smith, Riley Payé, and Erin Kennedy. Malori Clark, Daylen Holmes, Alyssa Syers, Monica Morris, Lizzie Willie, and Haley Golightley. Jon Claybaugh, Anthony Faletti, and Caleb Bettles. Clay White, Kaden Boatman, Semaj Smith, Logan Brewer, and Michael Rodriguez. Kyle Smith, Austin Sherman, Joey White, and Ian Smith. Zachary Heyer, Thomas Hecker, Joshua Waldorf, and Scott Garrison. Malori Clark, Sammi Twenhafel, Edna Vega, and Brianna Baxley. Emily Graham and Cheyenne Mapel. Kayla Wiggins, Nicole Crum, Joel Johnson, Megan Talbert, and Victoria Bardsley. Alyssa Bump and Hannah Titus. Garrett Misora and Stetson Carpenter. Tory Setzkorn, Evan Lyman, Mycheal Harrelson, Jon Lane, Braylea King, and Alexandra Scoggins. Michael Burley, Greg Coppola, and Woodrow Harmon. Ty Spencer, Ramon Ortega, Emily Lawson, and Zach Heyer.